Oriflame released the limited edition summer collection which is only available until August 30th. The collection is made up of three products this product, the tinted lip shimmer and Supreme length mascara. The aim of these products is to enhance what you have while giving you a natural glow. 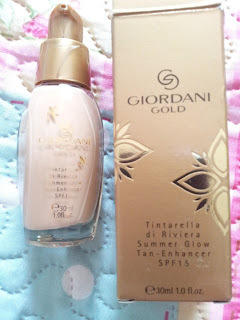 This is the Tintarella di Riviera Summer Glow Tan-Enhancer also dubbed bronzing shimmer, I've tried so many bronzers and 'glow' products in the past but they either leave me looking patchy or dirty. 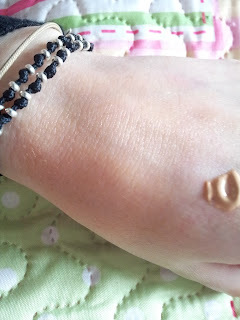 I just seem to be too light for more products including foundations. Although my past is pretty rocky with bronzers I still wanted to give this a fair run. This is a swatch of the product on the right and on the left is the product blended in. You can't see where it was can you? What the picture doesn't really show is the gorgeous illuminating effect that's left over from the product. Yay, you do not understand how excited I was when this blended in naturally. My skin definitely looks bronzed and glowing without looking fake. It's so easy to blend and I've used it to highlight my face and my legs without any bother. It does wash off easily but is tough enough to stay on your skin when it rains. This costs £7.95 for a 30ml glass bottle. You can purchase it over on the Oriflame website HERE but I do recommend stocking up because there's so saying if it will be back next year.